It has been awhile, but recently I was reminded that there is more to making bread than baguettes. A cold front in the Rockies also gave me a window to bake. 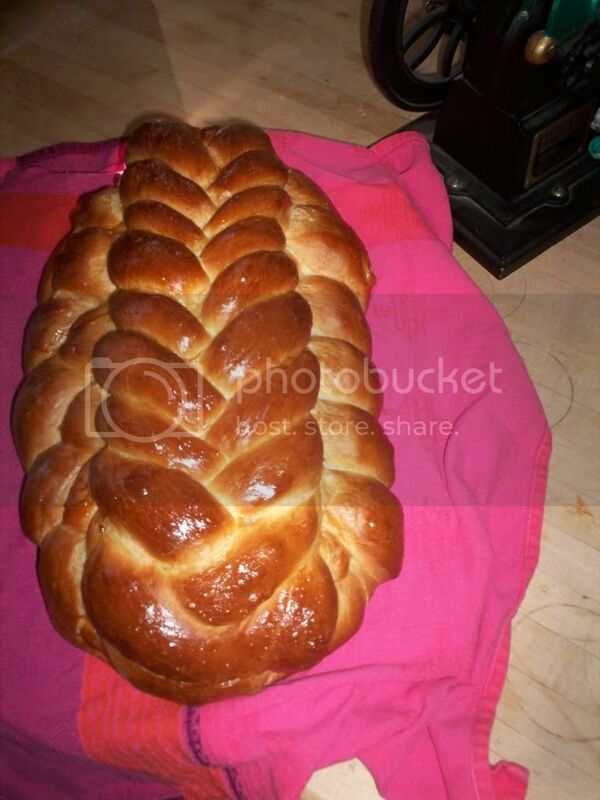 3 pounds or so of Challah dough. A base of a flat 6 strand braid (6 ozs per strand) with a 5 strand braid (4 oz per strand) on top. For the one or two of you following my continuing work with triticale, the Great Triticale Crisis of 2011 had me down to my very last bag of tribble food which finally I decided to mill. In the meantime, with the help of MiniOven, I found a paper from researchers at Colorado State University that contained the vital Mixograph and Absorption numbers that might help me make a breakthrough. Turns out that hydrations over 68% produce an elastic "wheat like" dough from triticale while lower hydrations produced the putty like dough that had convinced me to treat triticale like rye. The Mixograph results showed that triticale would have a lot less mixing tolerance than wheat (had to be careful not to overmix) and the researchers reported that they had no success using a Hobart dough hook, but better results with the paddle attachment. The work in this paper was done with white triticale flour, so I decided to mill a "closer to white" flour than I had been using. I followed my standard wheat milling process to get about an 85% extraction flour. I decided on a very simple formula with 30% of the flour pre fermented in a 68% hydration levain based pre ferment. 4% shortening, 4% milk powder, 2% salt, 1.2% instant yeast, 1% honey, and 69% water. (Calculation of the weights left as an exercise for the reader - it's really just a basic "sandwich loaf" formula - loaded pretty heavily with yeast.) I mixed for about four minutes with the Kitchen Aid paddle attachment, the switched to the dough hook - which worked well for me - for another 2 minutes. The dough was a very soft, sticky dough, but was fairly elastic with what I would consider low/ moderate gluten development. Thinking that I was now dealing with more of a wheat like dough than a rye, I gave it an hour of bulk fermentation - during which it actually doubled - which had not happened before with the triticale dough. It was a mess to shape and my shaping flaws probably influenced the crumb , but it doubled nicely in the pan. I baked it for 35 minutes at 375F and for the first time in my experience with triticale dough, got some oven spring. The results are pictured below. Not shredibly soft or fluffy, but for a near whole grain flour of a grain that is considered inferior for bread baking - not bad at all. 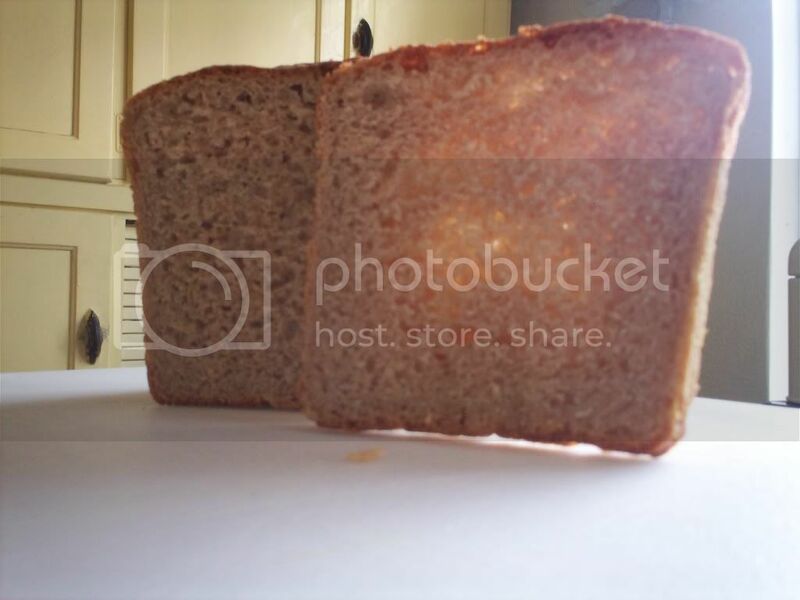 Although light can shine through the slice, it was sturdy and stood up to handling and soft butter. I should have included something to show scale, but it is a nicely sized slice for a sandwich. I am informed that my new shipment of triticale is winging its way to me as I type and I'll be able to continue this general track of baking. Next time I will lower the hydration somewhat (to take the hydration of the honey into better account)and give it a longer bulk ferment with a fold. In general I don't feel the need to do intensive mix for these panned breads and the Mixograph readings tell me that I can over-mix very quickly, so I don't think I will be increasing mix length by much, if at all. As an aside, some of my reading tells me that triticale was once considered an acceptable bread grain and was widely used in the North American West, but the structure of farm subsidies encouraged wheat production and triticale became less used for human consumption and because of its high yields and superior protein content was used for more for animal feed. It forces me to think about how policies determined in some far away corridor of power can impact what we eat and how we think of things. I am more encouraged on the triticale quest than I ever have been. People keep remarking that the bread is unusually delicious. Time to get cracking on some real formula development. Although I went into some detail with my panned bread recipe (which has stabilized at my last published formula (or can get snazzed up with the addition of 12-15% each of toasted chopped walnuts and prunes) I've been working up other formulas and channeling Richard Blais - ever unhappy with my baguettes - I have been tweaking formulas that others might call successful. Last weekend things seemed to go well. My first bake was a variation on the "Bear-guettes" formula where I took the hydration up to a (for me) stratospheric 70%. I was unhappy with the results of the non retarded dough, but given a long cold stay in the refrigerator and then warmed up at room temperature for a couple of hours, the dough was supple and easy to handle. I always cut a baguette in half and then in half lengthwise as a drive time snack for my faithful limo driver and when I saw it, I just had to take a quick snap as I ran out the door to catch my plane. Allow 12-14 hours to ripen. Mix to shaggy mass and autolyse for 45 minutes. Mix in spiral (or by hand) to moderate development - 3 minutes. Allow to stand at room temperature for 30 minutes. Bake with steam 5 minutes at 500F then 12 minutes at 460F with convection. The other formula I have been working on I describe as "Country Bread." 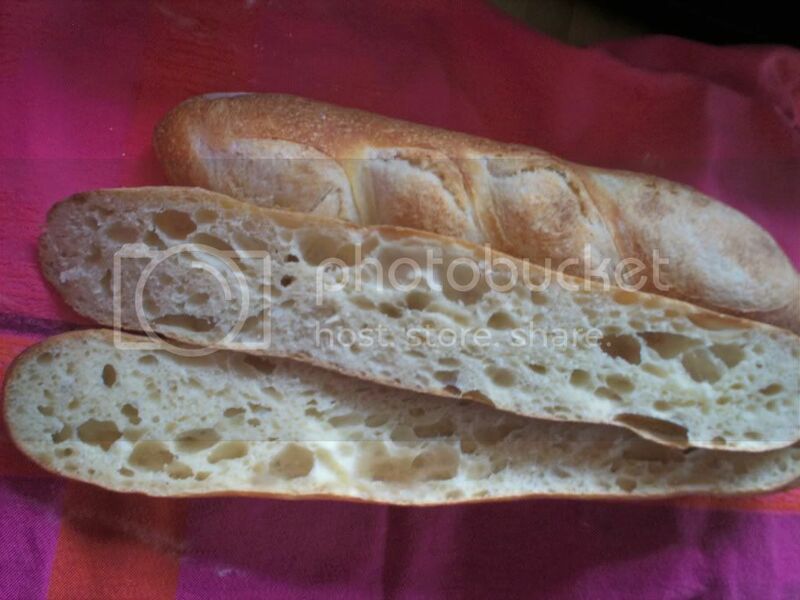 While the classic baguette limits us to a very strict list of ingredients and shapes, I wanted to make a bread that had a more varied list of ingredients and perhaps a different shape. One thing that I began to think about was making a bread with a more distinct sour flavor. My levain lives "free range" and is fed at least once a day. My house sitter feeds it when I am away and it does not undergo the indignity of being left in a refrigerator until it is cold and sad and creates hooch. As a result, it is a very mild levain. What I found out was that by using it with a rye pre ferment, I could get a sour flavor. I finally got a formula to my liking which is presented below. Both my rye and whole wheat flours are freshly ground. Mix to shaggy mass and autolyse 45 minutes. Bake with steam 10 minutes at 480F and then 20 minutes at 460F with convection. Last, but not least, I was looking over my old formula spreadsheet and comparing it to the BBGA standard. My old spreadsheet took the amount of the seed used in the levain into account as part of the % of flour pre fermented - the BBGA standard does not. While this keeps the math much simpler, it causes the actual amounts of flour pre fermented to be understated vs. my method. 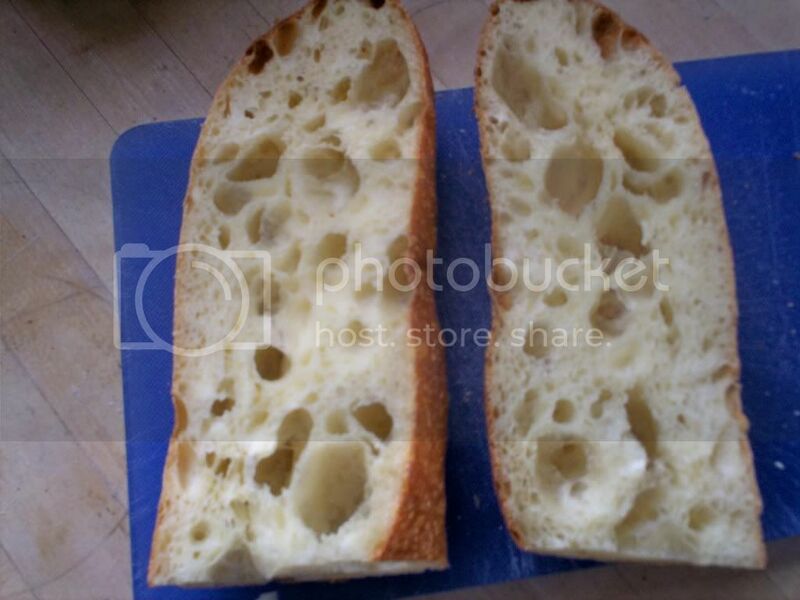 I've been thinking quite a bit about the impact of my altitude on baked goods in general and decided to drop the amount of flour pre fermented in my baguettes to 7% in the polish and 5% in the levain. I have a list of formulas that I want to develop this year and for the next bit I will be working on multigrain and "seedy/nutty" bread. We'll see how that goes. Once again Captain Kirk has saved the Federation. A new shipment of quadrotriticale will be delivered to Sherman's Planet. But how are they to eat it? Yes, it can be cooked liked rice or flaked and cooked into porridge. But what if the good people of Sherman's Planet want sammiches? What are they to do? In the spirit of "never give up - never surrender" (uh - a different space epic) I am determined to create a formula to bake triticale bread. Thinking over the dense but tender crumb of an earlier try and determined to apply things that I have learned about dealing with less than "perfect" wheat varieties, I formulated a plan. I was thinking a mildly enriched bread baked in a pan. 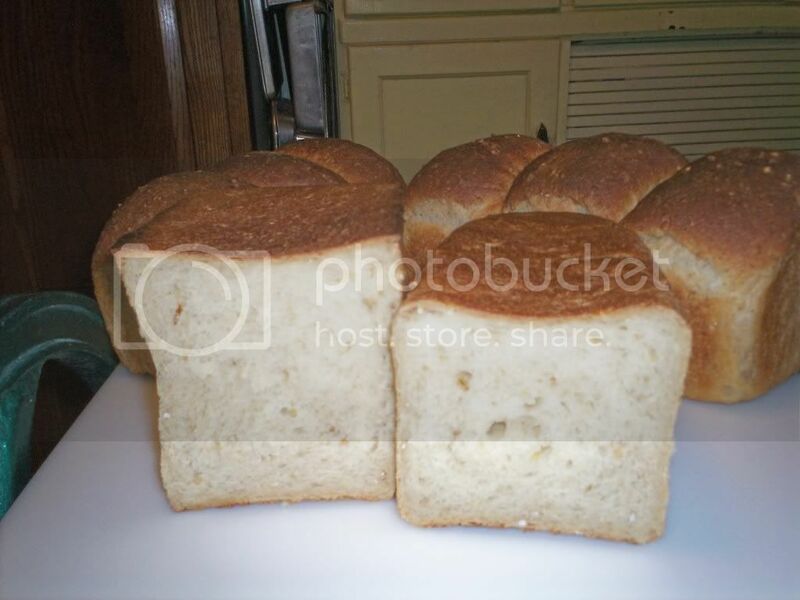 The Bob's Red Mill folks suggested treating the dough like wheat dough except letting it rise only once, shape, proof and bake. I remembered that the dough really behaved like a rye dough and pondered that I should not do the first rise, but considered that the miller should know. As you can see from the formula, I decided to preferment what is, for me, a very high percentage of the total flour in a firm levain. I chose a levain so that the higher acid would bring some strength to the dough and a firm preferment, again, to bring strength rather than extensibility. I also loaded the dough up with yeast, so that I would get as rapid a rise as possible. I would depend on the pre ferment for flavor. I milled the triticale to a fine, whole grain flour in three passes on the Diamant. I mixed the pre ferment by hand and allowed it to mature about 10 hours. Even with all the yeast, it took two hours of bulk ferment to get the dough to double. Honestly, looking at the risen dough it had a nice, open quality. For triticale, that is. I shaped the dough an put it into a high sided Pullman pan - brought back from Okinawa. I allowed it to proof until double - 2 hours. At that time the dough seemed exhausted and I popped it into a 375F oven for about 45 minutes. As before, when I had proofed it much less (Oh, I don't write up everything I do...), the dough had zero oven spring. What amazes me about triticale is the aroma. The plumbing crew fixing up my bathroom plumbing kept telling me how great the house smelled. The next day, sliced, I had reasonably sturdy bread with a sweet taste and that fine, tender triticale crumb - as pictured below. I keep mulling over how much more open the texture was after the bulk ferment and have pretty much convinced myself that next time I will treat the dough like a rye and give more of a rest before shaping and capture all of that rise in the proof. Rye bakers - advice welcome. The taste - delicious. Triticale is delicious and I don't know why it is so neglected. One of the many objectives of the formula development project is to gain understanding of the baking process. I have found that nothing beats working with the same general dough over and over, with very minor variations to understand the impact of various elements of the baking process. So when comments on my last entry wound around to "intensive mix" vs. "improved mix" and the somewhat weak crumb of my last loaf, I really wanted to give them full consideration. I may have mentioned elsewhere on these pages that my so called "normal" life contains, as a major feature, participating in the "security theatre" that is enjoying a long run in airports near you. Leaving discussion of the politics aside, it does provide me with long spaces of time where thoughts can roam free and it is wisest and best that they stray far from my actual circumstances and focus on something more pleasant - like bread. "Pat, please tell me two ways to achieve dough development." "One is through the action of the mixer and another is through time - that is the time spent in bulk fermentation - and folds, sensei." "And beyond the ingredients what produces flavor in bread?" "What have I said about intensive mix?" "That it is fine for panned breads where all one wants is to achieve is volume and one doesn't care about flavor, sensei." "And why would someone who uses intensive mix see no value in a bulk ferment?" "Because the dough is fully developed coming off the mix and many of the carotenoid pigments have been destroyed by the oxidation of the mixing process, so the bulk ferment is essentially working with damaged goods, sensei." "Is intensive mix ever appropriate?" "Yes, yes it is, but it will be a different style of bread than those made with longer fermentation times, sensei." "Speaking of volume - what does bread do best at high altitudes?" "Rises and achieves volume often collapsing in the oven since it rises higher than the baked supporting structure can sustain - forcing us to deliberately reduce the rising, sensei." "You sound like you are asking." "You know what to do. Bake and evaluate." Coming to with my hands above my head and a TSA officer telling me that I could go stand on the mat, I knew what I must do. Later, at home, giving the evening pizza crust a good twirl (my teacher once told me that this was a skill that s/he lacked and so I became obsessed with learning to twirl pizza crust) and reflecting that I had brought it to full twirl worthy development with nothing but time and some strokes with a plastic scraper, I reflected that there are indeed many ways to achieve a well developed dough. On the formula development front, I wanted to add an inclusion in the dough and had settled on flax seed. I'm a big fan of flax - it being the thing that produces my favorite cloth - and this bread being a reflection of my favorite things; it seemed to be the logical choice. I had some golden flax seed in the pantry and decided to use that. I created a soaker that seemed for all the world to be "hydration neutral" - it released no water when I put it in a sieve and seemed to have no droplets in the container that held it. Alas, as I added it to the mix, it did release some water and the dough hydration changed just a bit. Not enough ruin the dough, but definitely a change. Truly, I will be asking questions on this concept in the near future. I also decided to use bread flour (not high gluten flour) as a way to produce a somewhat tougher crumb - although I regret this decision because I will now have to go back and test the formula with all purpose flour, anyway. It would be cheap and easy to just call for bread flour, but as I have told many clients - I'm easy, but I'm not cheap. I mixed the dough for the six minutes that I had mixed it before - I feel that I might be able to mix it less, but I realize that My Precioussss is somewhat under loaded with this volume of dough and its efficiency is somewhat less at that load. I also wanted to recheck my dough development at this timing for the mix to satisfy myself that last week's crumb was not a result of poor dough development. It was a sufficiently developed at six minutes. No, it did not create the glove like windowpane as required by the shredibly soft loaf, but this dough is full of oat flakes and steel cut oats and these are going to keep that type of windowpane from forming no matter how long I mixed. The dough development was fine, and next time I will actually mix a bit less. What I did do was degas the dough better and put a little more muscle into my shaping. I also watched the proof very carefully and didn't try to compensate for pan size by proofing longer. The golden flax seed no doubt added some nutrition to the bread and did create a subtle and pleasant taste change, but it didn't create the hoped for "pretty bread." The crumb, however, was firm enough to hold a rather overstuffed grilled cheese and salsa sandwich, so I think I'll (sort of) be declaring victory on getting the crumb right by getting the shaping and proofing right. As I said before, now the work begins. I will be switching out the golden flaxseed for regular flaxseed next week and have high hopes that I will get me my pretty bread at last. But now I have to understand if I can use all purpose flour, get exact mixing times, get a better read on the soakers -and get exact weights for each type of pan and each type of shape that I wish to make. This is tedious in the extreme and I will probably suspend my posting on this until I can organize a tasting to compare the original- original and a couple of versions of my variations. I don't know if my version will "sell out at bake sales" yet, but as I taste it, it has that elusive quality of "balance." I can taste the molasses in the bread, but I can also taste the grain- it has little crunchies, but I don't fear breaking a tooth. If anything, the crumb is a little too light (although it passed the spread butter and the gloppy sandwich test) but by no means unacceptable. I've got a niggling little voice telling me I need to mill a lot more triticale and get to that ill conceived experiment of a high percent of pre fermented flour, some yeast and a pan and gardening/pond cleaning season is fast approaching - so plenty of other things to do while I make tedious small tweaks. Add soaker and mix only until combined (I did this mostly by hand). Added by edit: I was just reflecting on the process and looked at a picture of the bread at the beginning. I thought I would post it here so the contrast was evident. 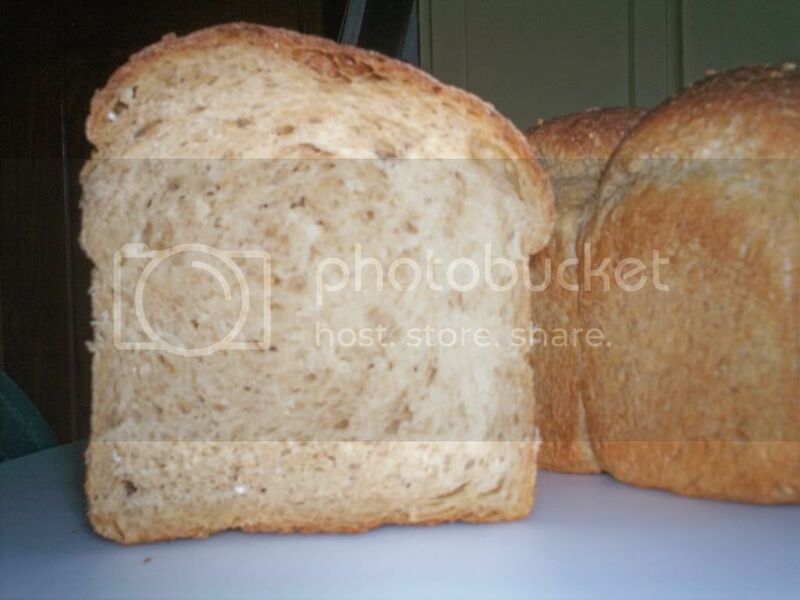 Hardly the same loaf at all! I may have mentioned somewhere in passing on these pages that I have a koi pond in my backyard. It is a beautiful and peaceful thing in the warmer months, but can be just a little grim in the clutches of a Rocky Mountain winter and fatalities among the inhabitants can occur. Since I am an omnivore, I try to be unsentimental about this, but there are always two factors that come into play in any fish death. One, even though fish must die some time, as with all living things, I always feel that it has been some failure on my part to provide them with the right environment that caused their demise. Two, these are not small fish. Death involves finding a place and digging a fairly large hole to dispose of the remains. Pulling the body from the water in winter conditions cannot accurately be described as being easy. So it was with sinking heart that I saw the tail of one of my 10 year old fish projecting from the rocks at the edge of the pond moving limply with the movement of the water. Thinking there was little I could do, I went about more urgent business and mulled over where the burial would take place. It seemed like the coldness of the water had preserved it well and the death had been recent since the scales still had a sheen to them. My house sitter dropped by to tell me a fish had been missing for three days. As we surveyed the protruding tail, I saw real movement. "That fish is alive," I said, "But stuck in the rocks." (Koi are not over intelligent, but they do have creative ways of getting into jams that will eventually do them in.) Without a moment's hesitation I lifted the heavy blocks that hold down the winter netting and began to remove rocks. The pond is a beautiful thing to look at, but was not built with rock moving in mind. Rock moving has to be done with one hand - one hand in water that in some places was still crusted with ice. If you wish to try this at home, take a large bucket of water and drop in a rock about the size of your head. Let the water stand in a warm sunny area until surfaces are uniformly covered in algae. Then chill the bucket until a crust of ice forms. Break through the ice with your non-dominant hand and attempt to pick up the rock. Imagine that if you drop the rock you will crush the life out of the creature you were trying to save. Let me know how it turns out. For bonus points have a small cut on one finger. In the end, the rocks were moved, the fish spent a few moments collecting itself, and then simply swam away to join its buddies. They're tough little spuds. My finger got some extra special attention (the infections one can get from pond water are many and can be quite nasty) and is recovering nicely. Life - Death - Life, again. A miracle on the pond. So what does this have to do with formula development? Well, a second miracle occurred at the Crumbled Abode on that day. I really liked the flavor of my developing formula. With the formula math corrected it turned out to be a lovely balanced bread with both the flavor of the grain and the sweetness of the molasses. I even liked the color which with the return of the molasses had turned back from tan to brown (which is not really shown well in the picture.) I really think that I have achieved contentment with the base ingredients. Perfection? No. But contentment. Yes, the doctors at "The Place" would call it a miracle. The crumb remains a bit too fragile, but I am still reluctant to try higher gluten flour. Examining a loaf that I had shaped using a different method, I am convinced for now that the fault, dear readers lies not in our gluten, but in ourselves. After years of light handed shaping, I think I am not putting enough oomph into forming the simple loaf. Also I transitioned to a larger pan at some point during my formula addling and I may be over proofing to compensate. Perhaps I will need to beat myself up for a few weeks over this until I give in and use bread flour or high gluten flour or perhaps I will just give in and steal from the best sooner rather than later, but I don't want to turn this bread into a chewy textured bread. (Geez, back to struggling to get the crumb right...) If anything, though, this bread rises too well and the crumb is too airy - which would seem to indicate that gluten itself is not a problem. But contentment with the base flavor frees me to consider inclusions. This bread already has some visible inclusions in the form of the steel cut oats and I don't want to turn this into seedy, nutty bread, but I think it could use just a little jazzing up in the form of another inclusion. Since the mighty Diamant stands ready, there are any number of cracked grains to consider. I've thought about millet - which is something I used to add to a beer flavored quick bread, but I'm not sure I want the crunch. Although I know that nuts would be flavorful, again, I am reluctant to put them in a sandwich loaf. I kind of feel the same way about dried fruits (although I ponder that once I get the base dough right loading it up in this way would be a tasty variation.) Well, I have time to consider. Pour boiling water over the two types of oats and allow to cool to lukewarm. Bulk ferment 4 hours at room temperature (warmer this week...). One fold. Shape. Proof 1.5 hours. Bake at 360F for 45 minutes. Here's where the long slog starts. In the world of the internet six weeks is a long time and six blog installments on the same old bread is reaching interminable. Yet I haven't even started to get down to work on this formula. Not that any of the result of my past 5 variations on this bread has been inedible or really even anything but pleasant eating. But "perfect?" No. I should have added "Check your math" or rather "Double check your math" because I was convinced that I'd done checked it. Which is why I've been writing up these little adventures - it serves to force me, even if a few days too late to make sure I've got things right. And at no point in the scaling and baking did I see the mistake. In fact I discovered it as I was writing this. I looked at my original formula and realized that I had been drifting a bit on hydration, so I rejiggered the formula so that I was adding the same amount of boiling water to my oats as the original (It would have been easier if that whole mess was "hydration neutral" but as good as that standard is, I'm leaving the practice for another day) with my beloved triticale preferment staying at a 60% hydration which is just a bit on the dry side for a panned bread - so I figured the hydration of the whole would be close to the original. 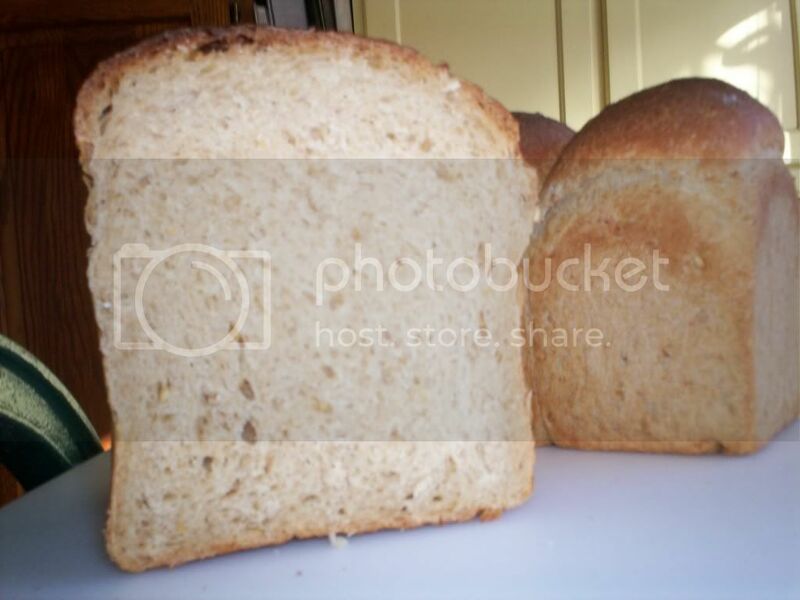 On LindyD's prompting I looked at Mr. Hamelman's formula for oatmeal bread - which differs significantly from mine, particularly in his choice of flour, his treatment of the oats, the type of oats he uses, and lack of the tribble friendly pre ferment. "Why not just bake his formula?" the alert reader might ask. Well, somewhat out of mule headed stubbornness, but mostly out of a belief that his formula is as frozen in time as my original starting point and in the infinite alternate universes which have been born and died since he wrote the formula, we in this one might have learned a thing or two. Besides, this whole exercise is formula development - not formula duplication. I was inspired by his use of whole wheat flour, though. So I decided to add in a portion of home milled to the mix. Since the molasses had been such a vital part of the original formula, I was determined to re introduce it - but gradually. Then I screwed up on the math. I failed to check a couple of formulas in my trusty spreadsheet that ... Well, I can make up a good excuse why it was easy to make the error, but I did it, okay, I made a mistake. So I'm not publishing the formula for this bake - because it is not what I intended to bake, nor should it be what anyone tries to bake (if you were baking along). But you gotta love this bread because even with my serious math error the stuff came out OK. Tasted fine. A little bland perhaps, but looking back on the nature of my mistake - to be expected. Nice crumb. I did take a picture and have posted it below. Tan loaf. Fine crumb. Sometimes mistakes are the eureka moment that we need. Not this time. It was just a mistake. So next bake, as my penance for making a formula mistake I'm baking the same (well, not really the same) formula again with the math corrected. Ah, the mill grinds slowly, but it grinds exceeding small. I'll post the real formula next week. Hopefully I can continue to tweak the molasses and deal with the troubling issue of "inclusions" in the not so distant future. My grandmother cooked professionally. I may have mentioned this before on these pages. She was not the "trained in culinary school" type of cook, she was a professional in the sense that a poor woman would be paid to cook in the home of a wealthy woman. As part of the whole "American Dream" experience for my family (a belated American dream perhaps as my ancestors were in America before the War for Independence) she cooked for many years in the home of the president of the university from which my brother and I obtained our undergraduate degrees. But as I have also said before, there are cooks and there are bakers and my grandmother was most definitely a baker. Curiously, she never baked bread during the time that I knew her. She may have spent her youth churning the stuff out and by the time I was inhabiting the planet she was pretty enthusiastic about the stuff that she could buy from the bread man. Interestingly, though, she did a lot of work with the 4-H and county extension office and was a well known judge for bread. In fact, when I was just a kid, every bread attempt I made was subjected to her expert judging. (I've discussed this with the doctors at "The Place" and they feel this explains a lot of things.) I always appreciated it. She was a stickler for measuring ingredients. I have a perfectly clear memory of making a simple frosting with her and she poured in a "smidge" of vanilla directly from the bottle. She warned me quite sternly that I was NOT to do that until I was as old as she. I am now that old. She also was the kind of person who enjoyed writing recipes. She wrote them to the very best of her ability to the standards of the day (at least the standards for writers for home cooks) so as my exploration of old recipes continues I realized that I had some long neglected recipes written by the very best source of all. No "butter the size of an egg" or "handful of flour" for her - these were all written with precise volumetric measurements and instructions that anyone with a reasonable grasp of basic baking skills could follow. The apple didn't fall from tree, eh? I cannot calculate a baker's percentage without wondering what she would think of the kid now. She enjoyed learning new things and I'm sure she would have embraced the whole thing as eagerly as I. When I retired her mixer (which is almost as old as my mother and which is still carefully stored in my house) about 20 years ago to buy the Kitchen Aide I couldn't help but think that she would have been pleased that I could go out and buy whatever mixer I wanted. I wonder what she would think of My Precioussss (which is the only mixer I have owned that can tackle her "Brown Christmas Cookie" dough) - I bet she would have gotten a big kick out of it. While "my teacher" is the voice in my head, she is the beat of my baking heart. She died too young - a victim of the lingering effects of bovine tuberculosis. She never saw my brother or me graduate from that university whose president she fed. So all of you who judge me harsh when people speak with near religious fervor of the goodness of un pasteurized milk must grant me some leeway. You now know what that stuff cost me. So I present one of her yeast based recipes. With volume measurements and no fancy modern techniques. As she wrote it. Soften yeast in the warm water (my note: see, she even knew that you didn't need to "proof" the yeast - just dissolve it - remind you of anyone? ), let stand 5 or 10 min. Mix together the sugar, salt, eggs and 1 cup of the melted butter. Gradually beat in the mashed potatoes, add 1 cup of the flour, beat until smooth. Stir in the yeast and beat enough of the remaining flour to form a light dough. Cover. Let rise in a warm place until doubled. About 2 hours. 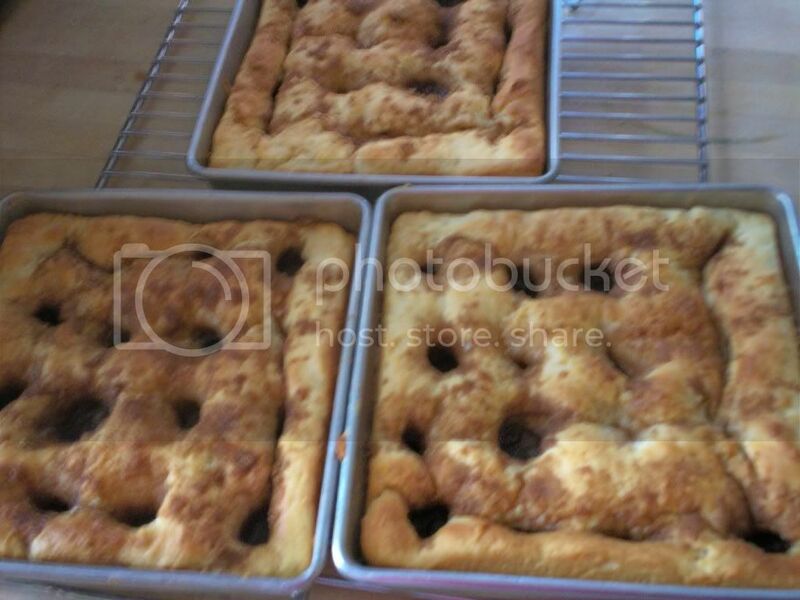 Divide dough into 3 portions and press evenly into 3 9-inch square pans. Cover, let rise until doubled. Make indentations about 1 inch apart in dough in each pan and spoon sugar mixture into each depression. Drizzle remaining ½ cup butter over top of dough. Bake at 350 F. for about 20 minutes. The picture below shows the finished cake. They do have a sort of "craters on the moon" look (which is how they are supposed to look.) They taste best if one makes sure to get that extra butter in the holes filled with sugar. The pans that I baked in were my grandmother's - still doing yeoman's work in my kitchen. Sometimes I get giddy - and that isn't a pretty sight. But I had just survived a week in a city that had its coldest recorded temperatures ever and departed from the airport like a traveler fleeing a disaster zone - no restrooms in the terminal - no lights on the jetbridge (a big "thank-you" goes out to the helpful gentleman who downloaded the flashlight app on to his iPhone!) A little cold in what should be a warm place and things go haywire. While sitting in what can only be described as a stress position on a regional jet, I tried to escape from the reality of the situation by thinking about bread. 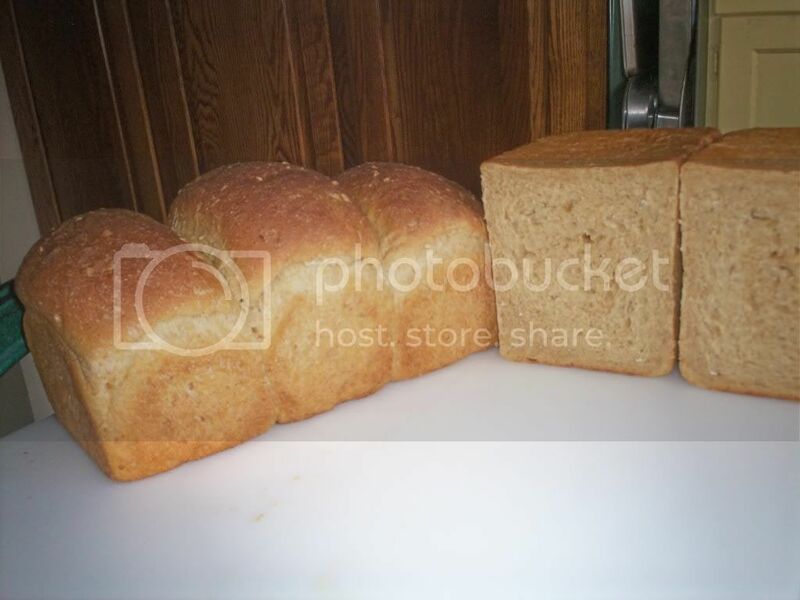 I came up with the idea to make two batches of panned bread with different sweeteners. My theory was that they would be two different colors and I could make a pretty loaf or two by combining the doughs in creative ways. Arriving home to greet the new lunar year - the year of the Rabbit - I did have to confront the reality that my feng shui advisor tells me my kitchen is now in situated in a very inauspicious direction and I should eat out every meal and avoid turning on the oven. Just this moment I'm thinking that is good advice. Although at the time I didn't allow it to stand in my way. I went back to 10% of the total flour in the pre ferment and that flour being freshly ground triticale, but vowing to use more local ingredients decided to make one batch with 3 oz of honey and the other batch with 3 oz agave nectar instead of molasses . Both of these are truly local. The agave nectar was a deep brown in the bottle and claimed to taste like molasses - so I thought it would be a good substitute for the somewhat less local molasses, and would turn the dough a darker color. Which is why my friends, I don't trust myself to improvise. 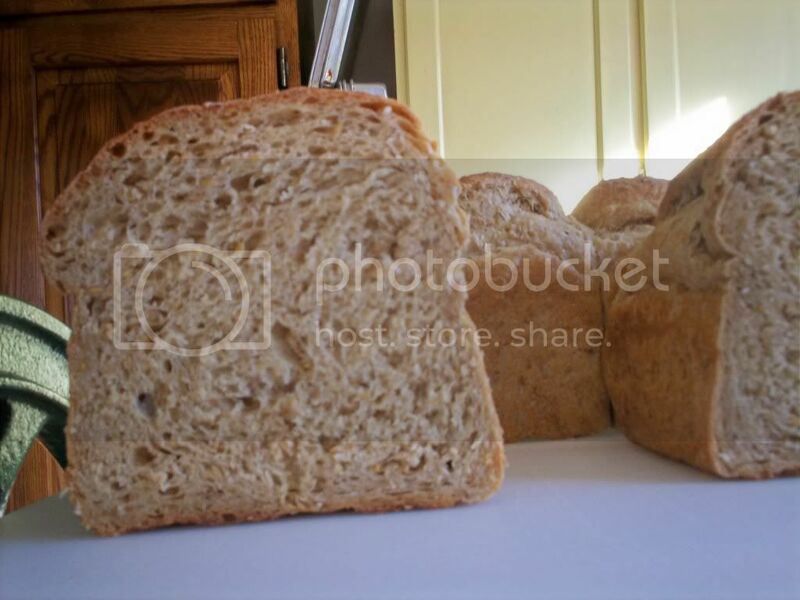 Both batches were the exact same color - so my little plan of a "pretty loaf" was pretty much gone. 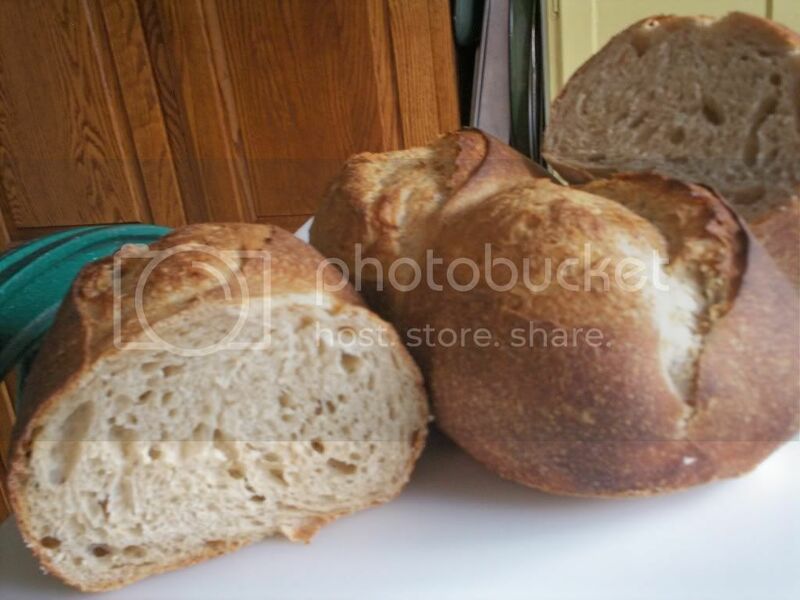 The doughs were pale - like a standard white loaf colored only by hints of the pre ferment. Of course, they didn't taste bad, but they lacked the nice molasses flavor of my earlier loaves. Local - schmocal - this Dutchie wants her molasses! It is a taste not everyone enjoys, but I grew up on the stuff. I could eat it straight from a spoon. To tell the truth, I would be hard pressed to tell the taste of the bread sweetened with honey from that sweetened with agave. They were both nice white breads with mildly sweet flavor. I consider that if I could get my hands on strongly flavored honey, like chestnut honey (which, of course would not be produced locally) I might have a different taste on my hands, but alas my access to this is limited just now and well, if I'm going to go non-local - I want my molasses! The general formula is below. Just use honey - or agave for all of the sweetener. See earlier blogs for the technique. It doesn't change. But the lack of the strong molasses flavor did do one thing - it allowed the flavor of the grains to come through. If you look at the original formula and how it has evolved, I've taken some care to reduce the yeast and slow down the overall fermentation process. I'm sure that this has had some impact not only on the flavor but on the crumb - still generally a fine grained tender crumb - which I hope to see when I bake the real original vs. my original vs. my final - which will come in the next so many weeks - or next year depending on my feng shui situation. (See, it's getting the fermentation "right" - which means right for the style of bread you are baking.) The true original would not have survived the lack of molasses - it would have had no depth (but still would be better than some of those things they sell in the supermarket). My current version could stand on its own. I had to wonder, though, if I had "over molassesed" the whole affair and obscured all that hard work on getting the fermentation "right" for this style of bread. I also began to think (because I apparently I do this kind of thing) about adding a little of that brown color back - not with the color of the molasses but with whole grain. "Two roads diverged in a yellow wood", but unlike Mr Frost, I may well have the opportunity to travel both. It is only some grain, yeast, salt and other ingredients - and that most precious one of all - time. It's a slow, agonizing sort of thing that I do. (Especially being able to bake only once a week. Hey, King Arthur Flour - if you need a full time high altitude test baker - call me!) I would like to have the genius to throw many things in the bowl of My Preciousss confident that it will be good bread, but that is not me. It never has been and I strongly suspect that it never will. Even if the bread was delicious, I would pound myself with "what if I had done X or Y - would it be better?" No, better to stay single factor. 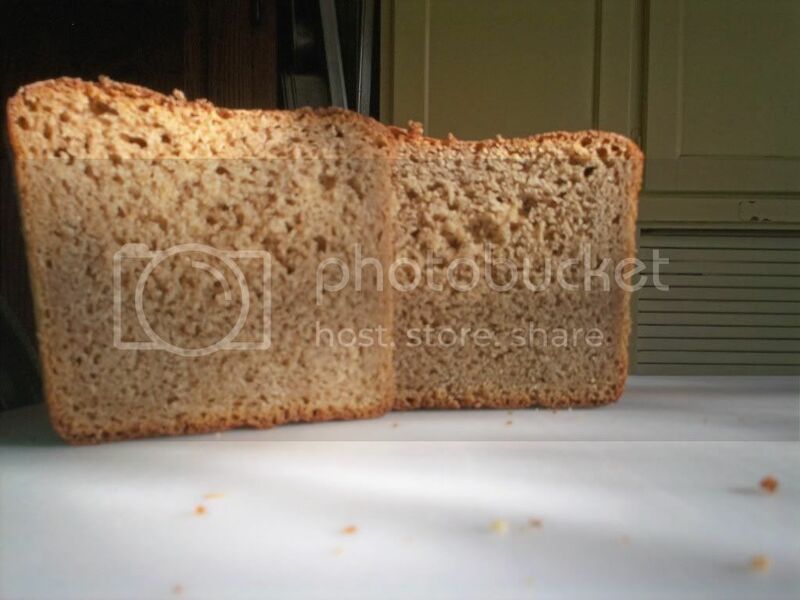 But I am nothing if not market driven (even overcoming my aversion to all acts photographic to post pictures of what I feel is much better described as "brown loaf - fine crumb") and so allowed myself to be influenced by cries for "More triticale, please!" So I increased the percentage of tritcale to 20% of the total flour in a firm pre ferment. One thing to realize is like its cousin rye, triticale absorbs a lot of water. Removing enough water from that used to soak the oats to make a 60% hydration pre ferment with the triticale left me with an oat mixture that was wet enough to soak the oats, but not enough (even when the pre ferment was added) to create bread dough. I had to add a full 8oz of water (in 2 oz increments) to get a somewhat tacky dough and I did need to mix for 8 minutes for the thing to come together. So, another slow step forward only to decide that this time I went too far. The bread wasn't bad, and to keep a complete log, I am presenting the formula in spite of its flaws. But now I am going to stop a bit and remember what I was trying to accomplish: Take a simply made sandwich loaf (and there seem to be a lot of very small variants on the "oatmeal bread" in the baking literature), use some of the newer techniques to make it better, and use ingredients that might be more local to the Mountain West. I have to lie to myself pretty much to claim that things like oats and triticale "could" be local. Certainly they have wider growing ranges than the very fine, fine wheat that we produce on our high plains, but they are more adapted to cool, wet climates. But oats are part of the original formula, triticale is my favorite, and there are times when my capacity for self deception is high. Add the salt, molasses, yeast, levain, and flour. Mix 8 minutes on the single speed of the spiral mixer. Or use your preferred method of mixing. But there are other ingredients to tweak (and using honey is just too obvious - or is it?) and the troublesome matter of "inclusions." While not wanting to make a seedy, nutty bread (I actually have, as one of my 2011 formula goals such a thing, but not in this style) I ponder what might make a not too crunchy set of inclusions for a good "sammich" loaf. I shall continue to ponder until I nail down next week's formula.